If you have 10 days to spare then this trip will offer a great overview of Morocco. Starting and ending in Casablanca you will enjoy the best of the north and the south. Two completely different experiences, the north offers a glimpse to the history of Sultans and Kings, artisans and craftsmen. See the capital city (Rabat), visit Roman ruins and wander the relaxed blue streets of Chefchaouen. After marveling at all that Fes has to offer you will head south to the Sahara desert for a night in a nomad camp and a camel trek. Take in the south of Morocco with it wide valleys, gorges and date palm filled oasis that stretch for miles. Visit kasbahs, Berber villages and eat your fill of dates and tagine. On to Marrakech for some city exploring in the medina and souks before you head off to catch your flight. Arrive in Casablanca and your driver/host will be waiting to greet you. Enjoy some time in Casablanca today if you have time. Your arrival time will really inform your plans. 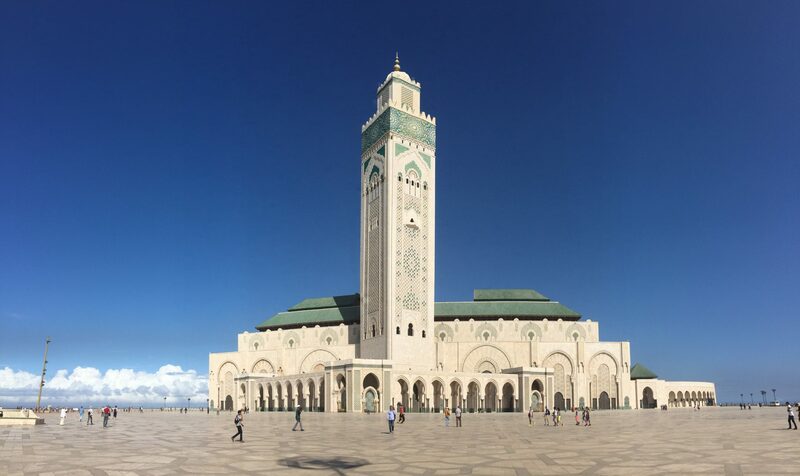 If you arrive in the morning for example you can visit the famous Hassan II mosque before heading to Rabat perhaps. Or, if you arrive later in the day, enjoy a night in Casablanca to catch your breath before we take it away with the sights ahead. 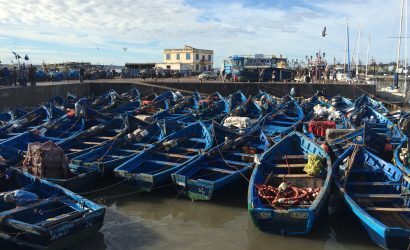 Leave Casablanca and drive north to the capital city of Rabat where you will enjoy a tour of a few hours of the highlights of this modern/ancient city including Mohammed V mausoleum, the Kasbah of Oudaya and Hassan II tower. Then head to Meknes, one of the Imperial Cities and site of the beautiful Royal Palace and stables. Enjoy lunch in the Medina (try camel meat if you like!) and then off to Volubilis. This is the site of Roman Ruins dating back centuries and surprisingly large. Here you will have a local guide to show you the site. After this relax and watch the scenery as you travel into the Rif Mountains to Chefchaouen. Spend the morning in Chefchaouen enjoy the fresh mountain air. Walk through the blue streets seeing the merchants and their wares, happen upon an artist or a weaver and enjoy a cup of coffee and some people watching. Make your way to Fes this afternoon out of the Rif Mountains into the plains that cradle this ancient hub of culture. Today you will meet your local city guide and enjoy a day tour of the medina and surrounding area. Marvel at the carved brass gates at the Royal Palace, walk through the Jewish quarter, meander through the narrow busy streets of the medina stopping for demonstrations of weavers, carpet knotting, brass hammering and tile and pottery making. Visit the famous tanneries, a UNESCO site and famous for its natural dying methods dating back centuries. You will stop for lunch along the way and return to your riad dazzled by the sights and sounds. Leave Fes behind, your camels await. Drive over the Middle Atlas mountains through the cedar forests and rolling hills. See Macaque monkeys and Berber horses and stop in at the small European hamlet of Ifrane, known at the “Switzerland of Morocco”. Then head south to Midelt, and on to the stunning Ziz Valley where you will see valleys and oasis filled with date palms as far as the eye can see. Berber villages and casbahs will take over the view as you head through Rissini and into Merzouga. Once there you will go off road for a bit before arriving at the base hotel where you will day good bye to the car for the night and hop on your camel for a trek into your camp. If you prefer we can arrange for 4 x 4’s to take you in and out. After making your way back to the car, you will ride through Erfoud (date capital of Morocco) and along the Valley of 1,000 Kasbahs (old and new) and drive towards Todgha Gorge. Spend some time exploring the gorge basin and marveling at the rock face (350m high). Stay in the nearby valley at an auberge and enjoy the traditional Berber lifestyle of the south. Travel through the southern villages today passing through Tineghir, and stopping at the Roses Valley where roses are plucked each year by the thousands and distilled to precious rose oil and other beauty products. Travel through Berber Villages and see what life is like in the countryside of Morocco. Pass by the khetteras, the ancient form of irrigation using underground tunnels and mounds. Visit Ouarzazate, an important city in the south and home to many movie studios. Finally arrive at Ait Ben Haddou kasbah, one of the most well preserved examples of kasbah architecture in the world. Explore the kasbah alley ways up to the top and get a birds eye view of the surrounding area before settling in for the night in the local village. Today you will head over the High Atlas Mountains. This is one of the most beautiful drives there is in Morocco. Up to the top of the highest pass at Tizi n' Tichka at 2260 m and down the windy roads into the valley that is home to Marrakech. Approach the Red City and settle into your riad near the old Medina. Enjoy dinner in Jemna el Fna square where snake charmers play their flutes and orange juice stalls beckon you to taste. Try snail soup if you dare, or just enjoy some traditional Moroccan bbq in the midst of the excitement. 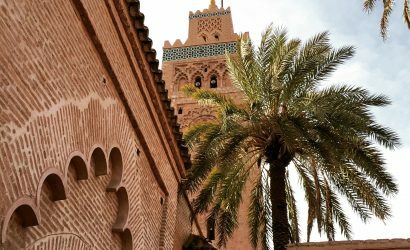 Your guide will meet you at the Riad for a 1/2 day tour of Marrakech including the Koutoubia mosque grounds, the Bahia Palace, Saadian tombs, and the Mellah or old Jewish quarter. After lunch do some shopping the souks for souvenirs and try your hand at haggling. Visit a local hammam or enjoy the Jardin Majorelle for peaceful escape from the chaos. Ideally you will be departing from Marrakech today, but if you are heading out of Casablanca we can make that work too. Keep in mind its about 3 hours to the airport there so we will need to plan ahead. Ah the beauty of a custom Morocco tour. Local city guides for private tours in Fes and Marrakech.